See also: Sumo, SUMO, sumó, sumô, sumō, súmó, and Appendix:Variations of "sumo"
From Japanese 相 (す)撲 (もう) (sumō). 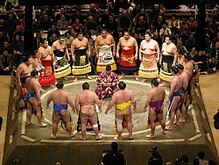 Sumo wrestlers gathering in a circle. (uncountable) A stylised Japanese form of wrestling in which a wrestler loses if he is forced from the ring, or if any part of his body except the soles of his feet touches the ground. (sports) sumo (Japanese traditional wrestling). From *susmō < *sups(e)mō, from sub- +‎ emō (“to buy, take”), (with excrescent p in sūmpsī and sūmptum). I take, take up, assume; seize; claim, arrogate. I undertake, begin, enter upon. I exact satisfaction, inflict punishment. I obtain, acquire, receive, get, take. I use, apply, employ, spend, consume. From Old Portuguese çumo, from Arabic زُوم‎ (zūm, “juice, sap”), from Ancient Greek ζωμός (zōmós). Cognate of Galician zume and Spanish zumo. From Japanese 相撲 (sumō, “to mutually rush at”). Borrowed from Latin summus. Compare the inherited Old Spanish somo, cf. also somero. Caiaphas was the high priest. First-person singular (yo) present indicative form of sumar. First-person singular (yo) present indicative form of sumir.